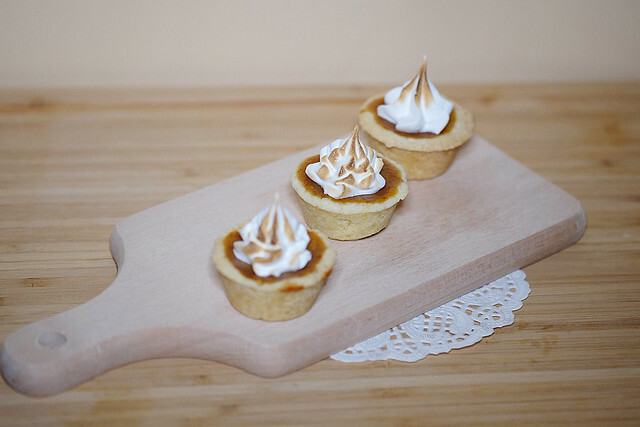 I made some mini pumpkin pie for a big party the other day. Add sugar to butter, mix well, then add egg, sieved flour and baking powder. Put the dough in the pie mold, making sure the pie crust is about 3cm thick. Place it in the fridge. Cook the pumpkin with a little bit of water and make a purée out of it. Add the rest of the ingredients to the purée. Take the pie crust out of the fridge and pour the filling into it. Be very careful, the filling is very fluid. Bake the pie in a pre-heated oven, 180°C for about 20-30 minutes. The pie becomes crusty, while the middle part of the filling was still wobbly. During baking, it rises like a soufflé, but as it cools down, the shape would change to be like a normal pumpkin pie. Place sugar and egg white in the heat-proof bowl. I used the Kitchenaid bowl. Set mixing bowl over a pot of gently simmering water, and whisk until sugar has dissolved and mixture reaches a temperature of 50 degrees. Transfer bowl to the kitchenaid. Using the whisk attachment, beat on high speed until mixture forms stiff and glossy peaks. This takes about 10 minutes. 5. Pipe the meringue onto the pie once the pie is cooled. Use a torch to torch the meringue.